Discussion on current state of City of Decatur by Decatur City Comission and Decatur School Board Candidates. Touching on a range of topics from annexation, to traffic control. There are a total of (9) 15 minute videos. 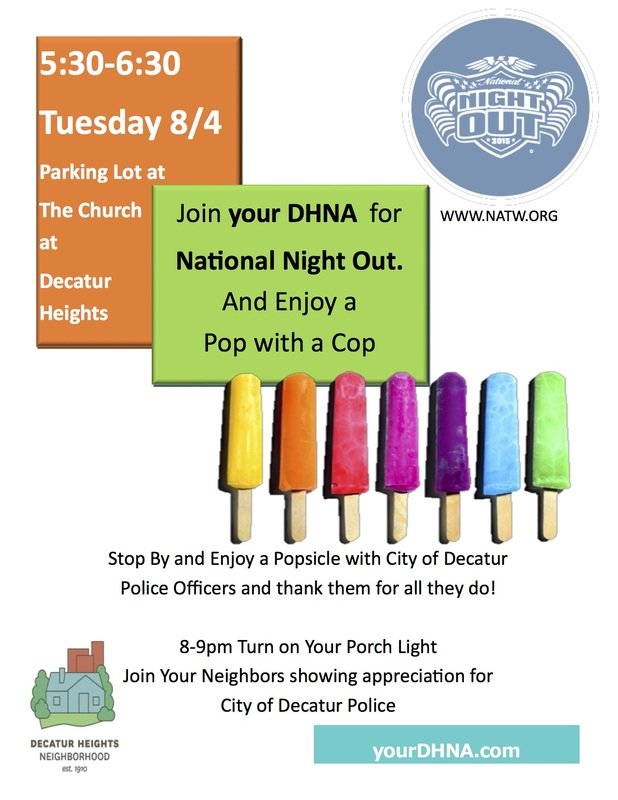 Hosted by Decatur Heights Neighborhood Association. Thank you to Daniel from Forever Dreaming Productions for his work on audio and sound production. 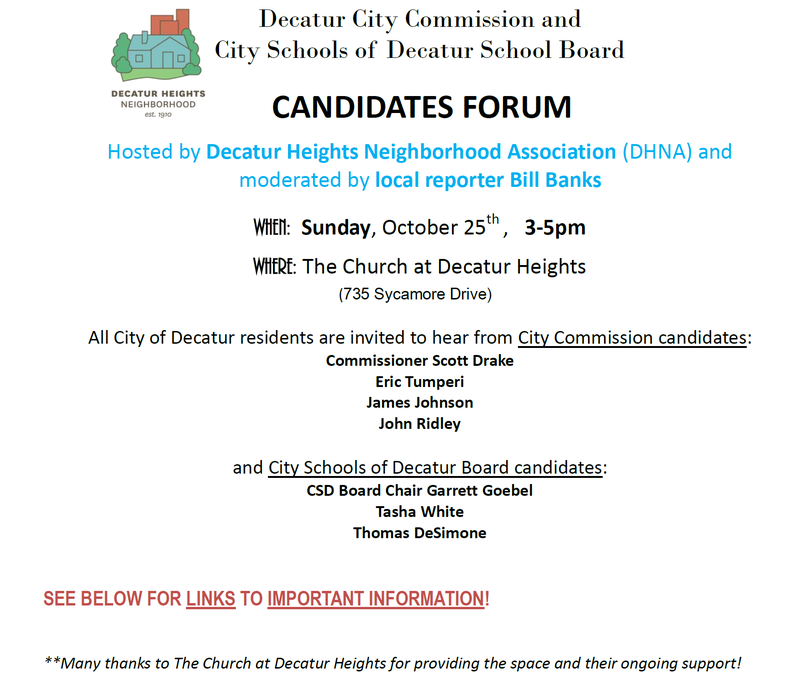 Candidates Forum October 25th 3-5pm. National Night Out Tuesday August 4th. your DHNA will be participating in this national event by hosting Pop with a Cop. From 5:30-6:30 come by to enjoy a popsicle with your local police officers and thank them for all they do. You can still participate in this event if you are not able to make it for a popsicle. From 8-9pm turn your porch light on to recognize local law enforcement. The Board of Education is very interested in your input as they seek to hire a new superintendent. City Schools of Decatur staff, students, parents and community members are invited to participate in this process by attending community forums and by completing a survey. This survey is designed to gather your perception on the importance of various characteristics commonly found in effective superintendents. The information will be used by the Board to determine the “Desired Characteristics” of our next superintendent. Please share your thoughts by responding to survey linked below. The survey will be open until June 3, 2015. As you respond, please remember that all characteristics listed are desirable, but we are interested in knowing your perceptions about which characteristics are “most important” for City Schools of Decatur. The consultant firm, Hazard, Young, Attea & Associates, will facilitate four community forums to seek input on the most desirable characteristics and skills that our new superintendent should possess. The CSD Board members, along with Hazard, Young, Attea & Associates, appreciate your willingness to participate in this very important process and look forward to learning your perspective. This Saturday, September 27th from 10 a.m. to 2 p.m. drop by and turn in your unused or expired medication for safe disposal in front of the Decatur Police Department, located at 420 West Trinity Place, Decatur, GA 30030. The goal of the DEA “Drug Take Back” program is to prevent pill abuse and theft by giving everyone the opportunity to turn in potentially dangerous expired, unused, and unwanted prescription drugs for disposal. Decatur last participated in the drug take back program in April 2014 and took in 150 pounds of prescription drugs. The Decatur City Commission voted to adopt a new Tree Canopy Conservation Ordinance that will go into effect on July 7, 2014. The purpose of this update is to modernize the current ordinance (which dates back to 1988) and to encourage the conservation of existing tree canopy. To learn more about the Tree Canopy Conservation Ordinance, a public information meeting has been planned for Monday, June 23rd from 6PM to 8PM at the Leverett Public Works Building, 2635 Talley Street, Community Room.